In this era of social media and increasing political and cultural polarization, we need to think more about how and why we converse with one another. Headlee—who hosts the daily news show On Second Thought on Georgia Public Broadcasting and has been involved in radio broadcasting since the late 1990s—debuts with a book offering different moves and steps to the oft-heard music of the self-help genre. Serious readers will be glad to see the text is not chockablock with bullet points and other graphic favorites (and clichés) of the genre. Instead, the author delivers well-researched and careful analysis of how and why we talk with one another—our strengths and (myriad) weaknesses. Throughout, Headlee surveys psychological and neurological research, reminding us, among other things, that we are not good at multitasking, that areas of our brains light up when we talk about ourselves, and that we have the attention span of a goldfish. The first half of her text is roughly a theoretical foundation of the second, which offers her “specific strategies” for conversing. She suggests that we keep conversations short, eschew preaching, recognize and acknowledge the limits of our knowledge, and listen. Most significantly, she continually returns to her theme of empathy, a factor missing in so many conversations. We are so eager to tell our stories that we neglect to listen attentively to what the other person is saying. 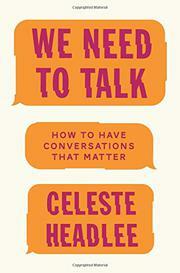 Occasionally, Headlee falls victim to platitudes: conversation is like a river; we need to be “fully present” in our conversations, etc. Still, she is appealingly self-deprecating, repeatedly discussing and dissecting her own conversational failures and disasters, and she alludes to a range of authorities on the topics. A thoughtful discussion and sometimes-passionate plea for civility and consideration in conversation.